Jussie Smollett has been arrested and charged with filing a false police report, after saying he was attacked in a homophobic and racist incident. The story has taken quite a few twists and turns since the Empire actor first claimed he was attacked by two men. Here’s a full timeline of what’s happened since January. Chicago police say they’re investigating a suspected racist and homophobic attack of Jussie – real name Justin – Smollett by two masked men which happened at about 2am. They say the actor was punched in the face, had an “unknown chemical substance” poured on him and a rope wrapped around his neck. Jussie Smollett tells police the two attackers also made reference to MAGA (make America great again) – the slogan often used by President Donald Trump and his supporters. He goes to a doctor and police describe his condition as “good”. Stars including Viola Davis, Janelle Monae and TI come out with messages of support for the actor. His Empire co-stars including Grace Byers and Naomi Campbell also show support. Jussie Smollett refuses to hand over his phone to police investigating the attack. They wanted it to confirm details – including the MAGA references made – as the actor says he was on the phone to his manager at the time. They say they won’t demand the phone. The actor says he’s “OK” after the incident. Chicago police also release pictures of two “people of interest” they want to speak to. Chief Communications Officer Anthony Guglielmi says “detectives are taking this development seriously”. At a concert that had been planned for a long time, Jussie Smollett makes some more comments on the incident. “I’m not fully healed yet, but I’m going to,” he says, reading from a piece of paper. “I’m the gay Tupac,” he finishes, without explaining what he means. Jussie Smollett gives police a PDF file of his phone records, after they had originally asked for his phone and he’d refused. But the files are redacted – some bits have been covered up. The police says there’s no reason to suspect any wrongdoing from Jussie Smollett and are “not even looking at charges regarding filing a false report”. The two people of interest are arrested and interviewed by the police, but not charged and not treated as suspects. They are Obabinjo (Ola) and Abimbola (Abel) Osundairo, brothers originally from Nigeria. They had worked as Empire extras, sometimes going to the gym with the actor, their lawyer says. Some of the items seized from a police raid of their home include a blackface mask, an Empire script, phone, receipts, a red hat and bleach. On the same day, an interview with Jussie Smollett is shown on Good Morning America. And speaking through tears, he says gay people should “learn to fight” these kinds of attacks. Chicago police say they have “no evidence to support” reports that the attack was staged. Chicago police say there have been “some developments in this investigation,” a day after they release the Osundairo brothers without charge. They say they want to speak to “the individual who reported the incident” – Jussie Smollett. They add it’s “impossible to believe” that the Osundairos “could have played a role in the crime against Jussie or would falsely claim Jussie’s complicity”. Chicago police say the actor is charged with “disorderly conduct/filing a false police report”. Earlier in the day, a reporter in the US obtains footage appearing to show the brothers buying materials, including ski masks, that had allegedly been worn by the people who attacked the actor. Mr Smollett’s lawyers say they will “conduct a thorough investigation and mount an aggressive defence”. The rapper 50 Cent, who had previously come out in support of Jussie Smollett, posts a picture on Instagram referencing the actor’s “gay Tupac” comment. In the picture, he’s put Jussie Smollett’s face over Tupac’s on the album cover for All Eyez On Me – and changed the album name to “all liez on me”. Jussie Smollett hands himself into police and is arrested. 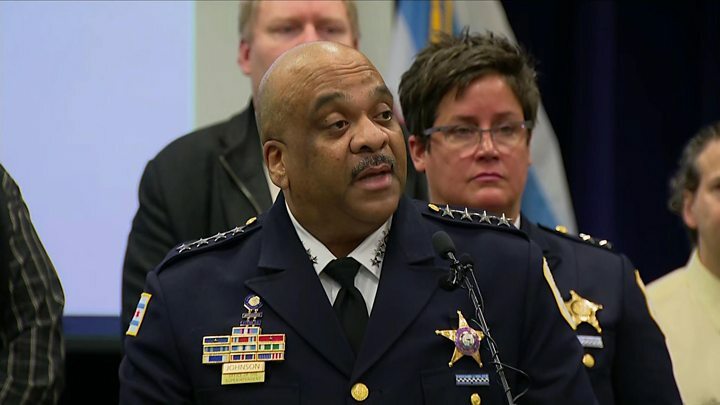 At a press conference, Police Superintendent Eddie Johnson says that Smollett “took advantage of the pain and anger of racism to promote his career”. He adds that the actor did it because he was “dissatisfied with his salary”. Police claim he also had sent a racist letter to himself at a Fox studio and paid the Osundairo brothers a cheque for $3,500 (£2,600) to stage the attack. Fox Entertainment and 20th Century Fox, the makers of Empire, issue a statement regarding the future of Jussie Smollett on the show. President Donald Trump tweets about the incident, calling the actor’s comments “racist and dangerous”. Later that day in court, Judge John Fitzgerald Lyke says that the “most vile” part of the incident was the use of a noose. Smollett’s lawyers issue a strongly-worded statement after the hearing, calling it an “organised law enforcement spectacle”. The TV show’s executive producers release a statement saying the actor won’t be in the final two episodes of the latest series. They add that the allegations against him are “disturbing”. Reporters in the US get hold of a copy of the $3,500 cheque allegedly paid to Abel Osundairo for the attack. 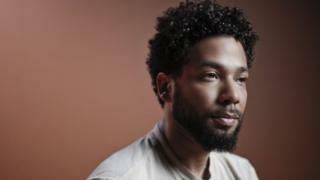 ABC News reports that Don’t Go is the name of a music video Smollett was planning to shoot – which is why he paid the brothers to get him in shape. A statement from the brothers’ lawyer Gloria Schmidt says they have “tremendous regret over their involvement in this situation”. The first new episode of Empire is aired since the alleged attack. 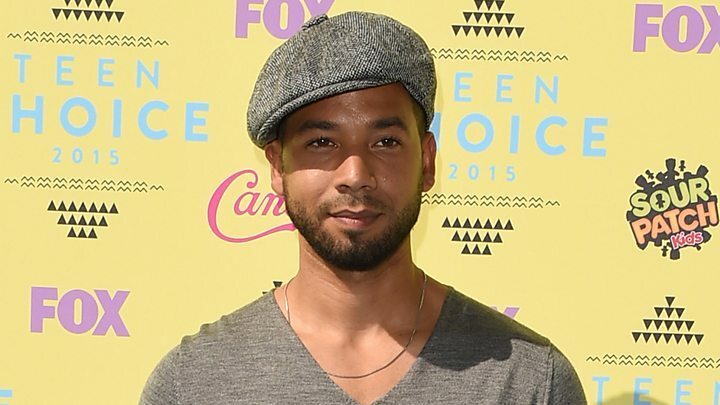 Jussie Smollett’s character Jamal Lyon features in the episode, which is down in the ratings, according to Variety. He is scheduled to appear in seven of the remaining nine episodes of season five. 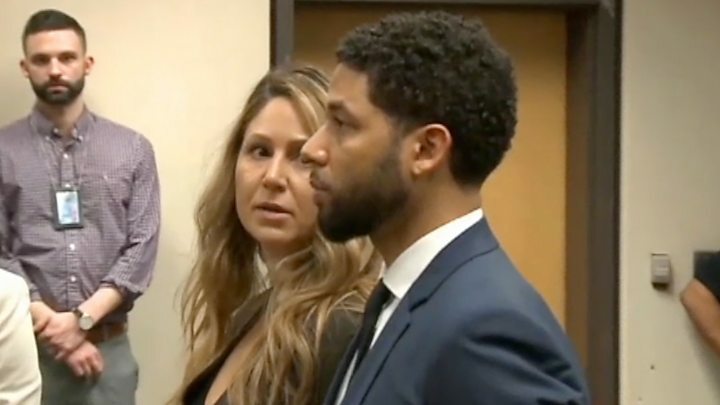 Jussie Smollett appears in court charged with 16 counts of disorderly conduct and pleads not guilty. He must tell the court if he plans to leave the state of Illinois and is due back in court in mid-April. Lee Daniels, the creator of Empire, speaks about the “pain and anger and sadness and frustration” he and his cast have gone through over the saga.